Customers are “a guest once, and then after that, they become family,” said Dave Daley, who opened the Spokane Valley café a year ago. “If you make it a personal experience, they’re going to come back and make this their place,” he said. 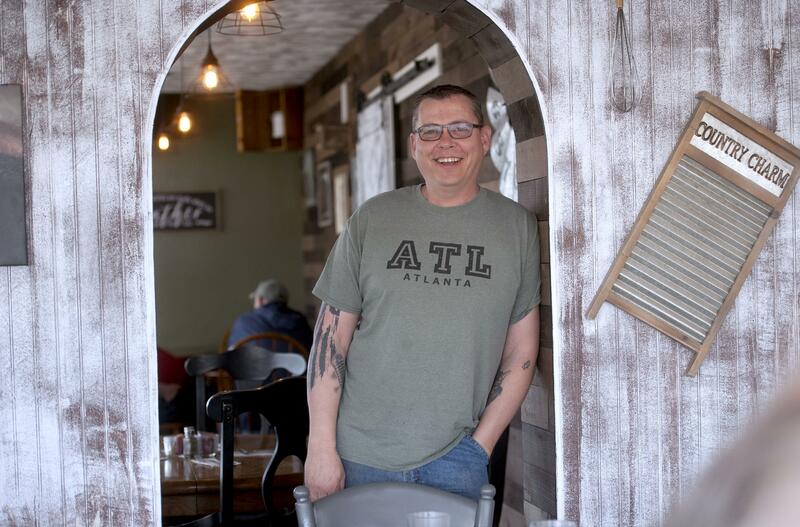 Brian Wells, a customer who lives down the road from the café, enjoys coming to the Stupid Cow because of the down-home cooking and family atmosphere. “Country” is a fitting description for the historic building. When it was built in 1927, the building was surrounded by apple orchards and sat just down the road from the Morrison Ranch, which is still in operation today. Originally rumored to be a train station, the café has also served through the years as a gas station, diner and car dealership. Some locals remember walking over from the high school across the street (now the site of Greenacres Middle School) to grab a bite from the diner on their way home from school. To keep the quirky, country vibe going, Daley mounted a working stoplight outside the front entrance (green means the café is open, red means it’s closed). A dozen round wooden tables in varying sizes dot the dining area. They can be pushed together to accommodate large groups. The Stupid Cow’s breakfast menu is loaded with comfort food. Signature items include the Heavenly Sandwich (vanilla-cinnamon French toast filled with egg, cheese and your choice of meat) and Biscuits and Sausage Gravy (the gravy is made from scratch in small batches each morning). Omelets, French toast and sweet cream pancakes also make an appearance, among many other things. Smaller portions are an option, although most meals are generously sized. “If you leave here hungry, you did not get treated properly,” Daley said. Daley, an Army veteran who owned and operated Daley’s Cheap Shots bar on East Trent for 10 years, decided to open The Stupid Cow Café to pursue his passion for cooking. Daley purchases all their food locally whenever he can, going out each Thursday to various grocery stores and vegetable stands. All their meat comes from Sonnenberg’s Market & Deli. Most items on the menu are made to order from scratch. “It makes a massive difference when you’re not using pre-packaged things and you can do it all yourself,” he said. He believes that the café’s food is what sets them apart from other restaurants in the area. The first weekend the café opened, Daley says they were completely unprepared for the number of customers who flooded the café. Daley says he ended up comping about $1,400 that weekend, all in an effort to make it right for those customers. “Almost every single one of those customers that were here on our first weekend are still coming back today,” he added. Now that the café has found its footing, Daley has plans to expand with eight extra tables on a patio out back. And opening a sister location is in the works within the next two years. The name? The Angry Chicken. As for the Stupid Cow Café’s unique moniker, Daley insists he has no cow-related trauma in his past. The quirky name may draw people in, but Daley believes that – along with the food – it’s the friendly, family feel that keeps customers coming back.